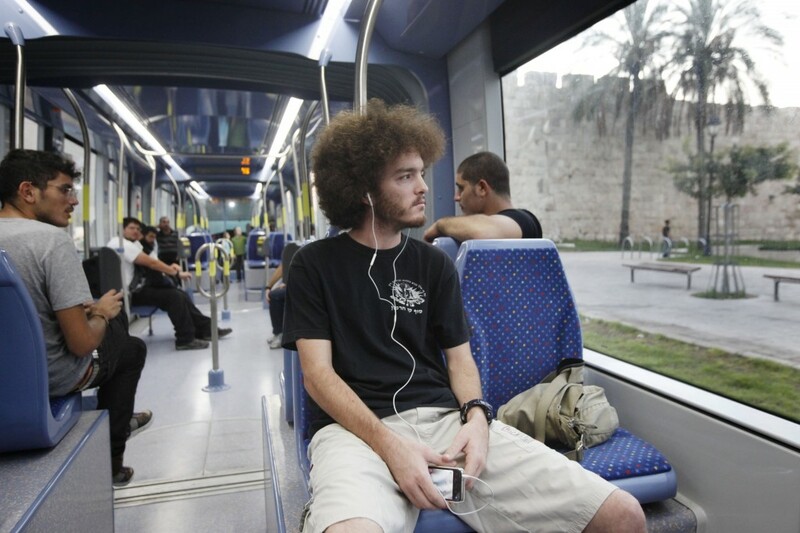 A passenger boards the Jerusalem light rail at its first stop in Pisgat Ze’ev, a suburb built in the West Bank after 1967, and glides past the local mall. A Russian girl gets on in high boots and works the aisle like a runway, trailing perfume. A toddler with a shiny pink purse sits next to her mother, who wears the long dark coat and hair covering of a religious Muslim. After the car stops in Beit Hanina, a middle class Palestinian neighborhood, the tinny electronic music of a video game becomes audible from the vicinity of two Arab kids and an iPhone. The train passes Eiffel Sweets, on the main drag through the Palestinian neighborhood of Shuafat, and the Stylish Salon. Outside the battle memorial at Ammunition Hill, three men kneel toward Mecca in a parking lot. Two women board with a gaggle of small boys in black velvet skullcaps and girls in skirts. The Ottoman walls of the Old City pass by before the train reaches the downtown bustle of Jaffa Road, where a crush of everyday Jerusalemites presses on with a backpacking couple in North Face jackets, and the car moves again. The train empties at the central bus station, where Jerusalem has begun to claim the new benches and walls of the light rail stop as its own with grime and graffiti, then fills up again, and travels onward to its final stop near the gravesite of Theodor Herzl. Beginning in the early 1990s, much of the planning work on Jerusalem focused on how the city could be divided between Israelis and Palestinians. Various schemes imagined walls down the center of main thoroughfares, crossing points, and a border meandering among neighborhoods and cutting residents off from each other. In recent years, however, new infrastructure projects have quietly but dramatically created a reality that flies in the face of those plans. The light rail system, an upscale shopping plaza outside the Old City, a new bike trail, the sheer force of everyday life and business — these things are slowly but surely drawing the city’s disparate parts closer together. There is still no great love among the city’s different groups. There are steep inequalities in municipal services and funding between Israeli citizens and the one-third of the city’s residents who are Palestinian Arabs. The meeting of the different groups is often charged and occasionally violent. But Jerusalem in 2013 is a more integrated city than it has been in decades. 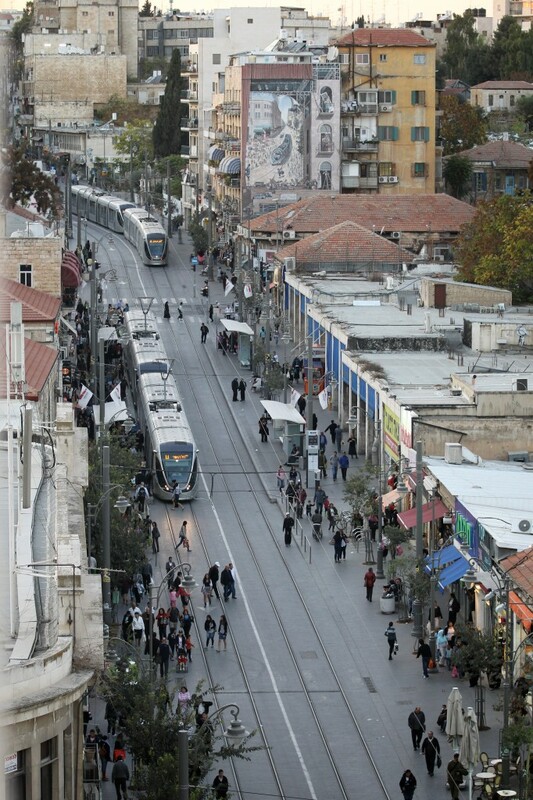 A passenger who rides the length of Jerusalem’s light rail line, even one who has spent much of his life here, might be surprised by what he sees out the window. Jerusalem’s different areas have traditionally been served by their own transportation services with their own centers, routes and destinations — Palestinians, for example, have their transportation hub at Damascus Gate, while the ultra-Orthodox have taken to using private buses departing from their own neighborhoods to get to ultra-Orthodox suburbs. The light rail, which opened just over a year ago and whose effects are only beginning to register in earnest, is the first major transportation project in the city to purposely violate those lines and link the different pieces. Early on, that made it the target of criticism from Palestinian Authority officials and advocates of anti-Israel boycotts who saw it, correctly, as a project that would bind Jerusalem’s residents more tightly to each other and ease their lives in the present-day city controlled by Israel. By doing no more than carrying out the necessary urban task of moving people to work and home again, the train ends up reprogramming the way passengers view Jerusalem. Anyone attentive enough to look out the window encounters a place that is home to ultra-Orthodox Jews, mainstream Israelis of various shades, Palestinian Christians and Muslims, soldiers, policemen, clergy, all living in close proximity to each other and moving in and out of the city’s shared spaces. This is a city unrecognizable in the newspaper headlines and peace plans that tend to portray Jerusalem as a problem to be solved or a kind of geopolitical puzzle, rather than as what it is: A fractured but distinct urban organism full of people going about their business — one city, indivisible. The idea of an “east” and “west” Jerusalem has always been more a theoretical shorthand than a workable description of reality. There are Jewish neighborhoods to the east of the Arab ones of “east” Jerusalem, and Arab neighborhoods to the west of Jewish ones in the “west.” But the recent developments are additional proof — at least for some of those concerned about the city as a place where people live rather than as a chip on the poker table of the peace process — that Jerusalem’s urban health lies in the integration of its parts, and that any solution will have to involve sharing the city, not splitting it. “The geopolitical solutions and a functioning city — it’s either one or the other,” said Eran Feitelson, a geography professor and expert on urban planning at Hebrew University. 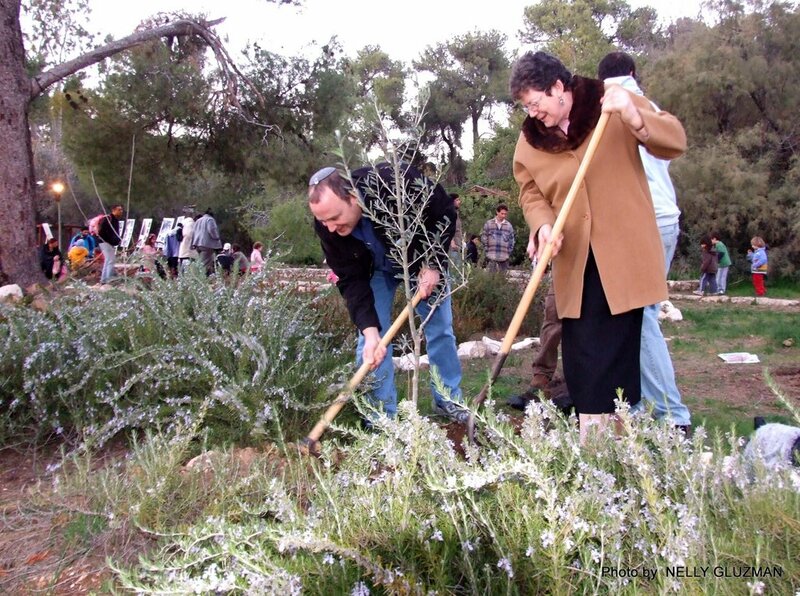 Naomi Tsur, the city’s deputy mayor in charge of planning, conservation and the environment, is a former head of the Society for the Protection of Nature in Israel, the country’s premier environmental group. She was born in Bristol, England, and is certainly one of the only politicians in the country to favor long tweed skirts. “It is one of the achievements of this administration to create a language of communication and transport and mobility through the city,” she said. 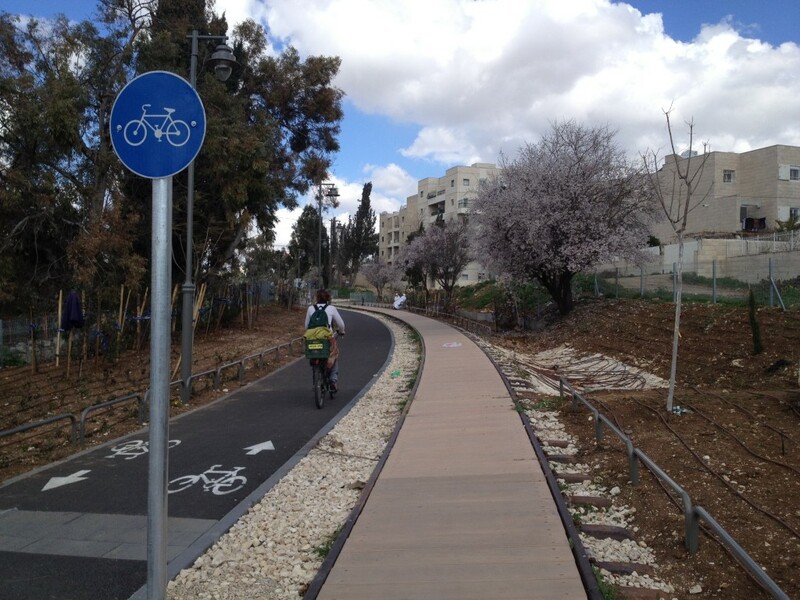 Tsur was a key force behind one of the most striking new additions to the cityscape — a 5-mile walking and biking path along a defunct rail line in southern Jerusalem. The path, which opened in part last year and is now nearing completion, begins at the old British Mandate rail station in the German Colony, passes through the working-class apartment blocks of the Katamonim and behind the city’s main industrial zone before terminating at the shopping mall at Malha. On the way, it runs through Beit Safafa, an Arab village once split between Israel and Jordan and reunited after the 1967 war; a first-time visitor might be surprised to find himself suddenly next to the village’s mosque and well-tended soccer field. 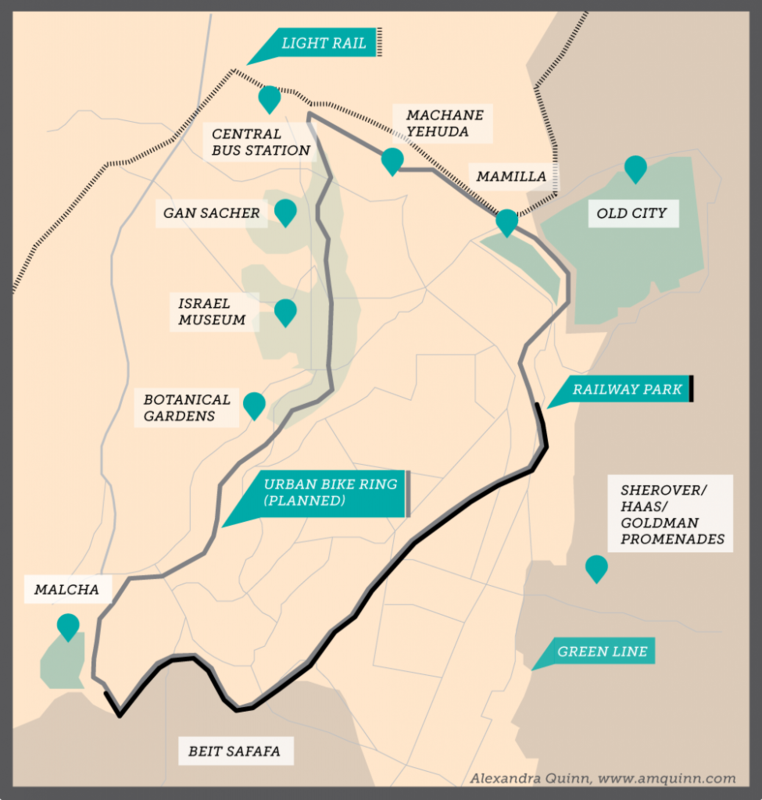 Eventually, the path is supposed to be part of a ring of bike trails around much of west Jerusalem, linking Beit Safafa and the German Colony to the Valley of the Cross, the Knesset, the central bus station, downtown, and the Old City. “We’re not an apple that can be cut in half,” she said. At Mamilla, outside the Old City’s Jaffa Gate, a new row of luxury shops and cafes has become a bridge between Jewish and Arab areas and the scene of mixing between the city’s populations. Marik Shtern, a Jerusalem media consultant active in local politics, investigated the interaction there as part of a Masters thesis at Hebrew University’s department of geography. Shtern interviewed 60 people at each of three commercial areas in the city where Jews and Arabs mingle – the shopping mall at Malha, the main Arab market in the Old City’s Christian and Muslim quarters, and the Mamilla plaza, where the first stores opened in 2007. At Malha, located in a Jewish commercial and residential area, Jews and Arabs felt threatened by the other, he found. In the Old City market, an Arab commercial and residential area frequented by Jewish shoppers, the same was the case. On its home turf, each side felt the other was invading its space, and on the other side’s territory each side felt at risk. At Mamilla, however, the results were different. “The two groups reported a high sense of security and a high level of tolerance for the other group,” Shtern said. 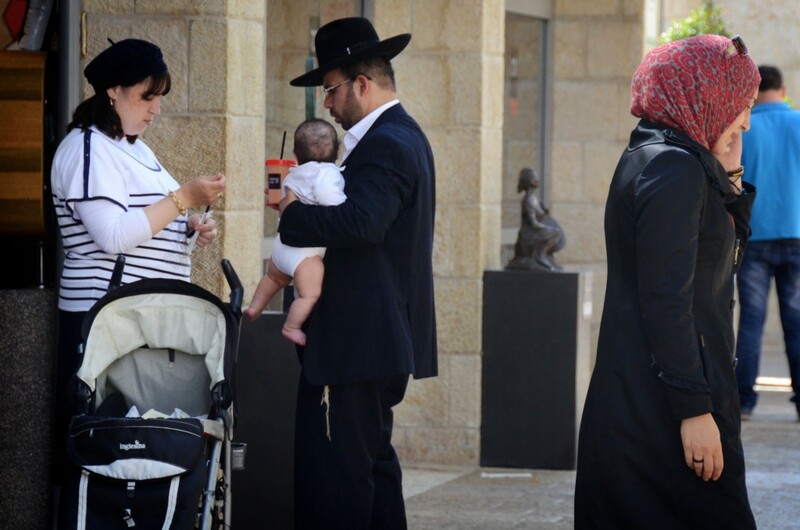 In part, he believes, this is because the pronounced presence of tourists lends Mamilla the ex-territorial feel of a place not quite on anyone’s home turf, and because shoppers there, Jews and Arabs, tend to be relatively well-off. But it is also because its location along the border between the city’s Jewish and Arab areas means both groups feel they are close to their own safety zone; because security guards are present, which helps reassure Israelis; and because there is no security check at the entrance, a common feature in Jewish areas because of terrorism fears, and one which tends to make Arabs feel unwelcome. The city, Shtern says, has to think carefully about the areas where Jerusalem’s different groups meet — how to plan them, how to secure them, and how to create safe spaces where mixing can take place. “In Mamilla people aren’t hugging each other or anything like that, but it’s enough that there’s an area where Israelis and Palestinians don’t feel tense around each other — that’s an accomplishment,” he said. If the city doesn’t invest enough thought in how the integration happens, however, Shtern believes the result will be increased tensions. He pointed to instances of violence on the light rail, mainly on the northern part of the line near the stops in the Palestinian neighborhoods of Shuafat and Beit Hanina and the post-1967 Jewish neighborhoods of Pisgat Zeev and French Hill. The incidents are the exception, not the rule, but are nonetheless notable: A light rail security guard used pepper spray on Arab passengers in one case; in another, a Palestinian assailant stabbed a 19-year-old woman soldier, and last week saw an attack by several Jewish teenagers against an Arab woman. There have been several brawls on the light rail, in addition to sporadic flare-ups elsewhere in the city — attacks on Arab teens downtown, ongoing tensions between Palestinians and Jews moving into Arab neighborhoods, and most recently, anger among residents of Beit Safafa over the expansion of a municipal expressway through their neighborhood. The new developments are occurring, not coincidentally, during a relative lull in Israeli-Palestinian violence, and with other factors — like the security barrier, which has severed east Jerusalem from its natural hinterland in the West Bank — serving to push Arab Jerusalemites toward some form of integration with the Israeli side of the city. As Nir Hasson reported in Haaretz in December, the numbers of east Jerusalem Palestinians requesting Israeli citizenship and taking the Israeli high school matriculation exams are up, and more Palestinians are visible downtown and in other Jewish areas. He called the process a “tectonic shift” in the city. “These processes can be described as ‘Israelization,’ ‘normalization’ or just plain adaptation,’” Hasson wrote. Eran Feitelson, the Hebrew University urban planning expert, remembered roaming around the Old City and Jerusalem’s Arab areas in the years after the city’s reunification in 1967. As a youth group leader in the 1970s, he led night hikes near the east Jerusalem neighborhood of Silwan, and took Palestinian buses from Jerusalem to Bethlehem. That openness was killed in the late 1980s by the first intifada and buried after 2000 by the second. Today, such activities would be all but unimaginable for a Jewish Israeli. For Jerusalem, the key will lie not in dividing the city but in continuing the attempt to share it, he said. This entry was posted in Business and Commerce, Middle East Report, Monotheistic Religions, News Articles, Recent Posts. Bookmark the permalink.